How fast is shipping? What shipping options are available? During checkout, you will receive a list of shipping options based on your address and package. We use USPS and offer First Class, Media Mail, and Priority Mail shipping options. We will ship your item from our warehouse in Florida within 3 business days of your order. Our shopping cart software automatically generates a shipping rate, based on your address and package weight, pulled directly from USPS’s website. For domestic orders, we add a fifty cent or one dollar mark-up, depending on the service you select, to cover packaging costs. If you have questions about your shipping quote, please contact us and we can work with you to reduce costs. You can also order the book from Amazon and take advantage of their free and cheap shipping options. You will receive email notifications when your order ships. Your account page may also have details. Please contact us if you are having trouble locating your order information. Yes, we provide no-questions-asked full refunds (less shipping) for items returned in their original condition. We do not cover return shipping. Before shipping the product back to us, please contact us for an RMA, so that we make sure we credit the right person! We package our products to minimize the changes of damage during shipment, but it can happen. In this case, please contact us and we will be happy to make amends. 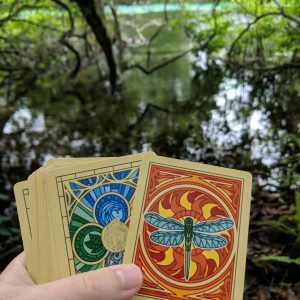 Do I need to buy the deck and the book together? Can I just buy the book or deck? 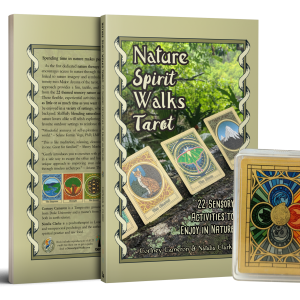 While we recommend obtaining both the deck and the book together for the full Nature Spirit Walks experience, you can use the deck or book as standalone products. The back of the book includes a reproduction of the deck that you can simply view or cut out, although the quality of this extra deck is much lower than the actual deck; however, the book also includes techniques for selecting an activity without a deck. If you plan to use the deck for your own personalized activities, tarot readings (you’ll need to combine with another deck for a full spread), or just as a keepsake, you might find that you don’t need the book. No, the cards are not waterproof. However, as you might be able to tell from some of our action shots of the cards, we have gotten our cards somewhat wet (from the rain or placing them on a wet surface) multiple times, and they look okay after drying. The front and back are somewhat water resistant, but the edges (where the cards were cut) are not. If you get your cards wet, spread them out to let them dry. After they are fully dry, if they are a little warped, stack the cards and place a heavy object on top of the stack for one day to flatten them out. Do you offer discounts for schools and non-profits? Yes, we feel quite strongly that students and learners of all ages can benefit from our program, so we have a discount program for schools, non-profits, and educational institutes. Please contact us for details. What is the “donate a book to a school” option? During checkout, you have the option to check a box that allows you to donate a copy of our book, at a discounted rate, to a school as part of your order. 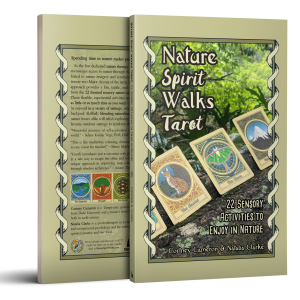 If you select this option, Nature Spirit Walks will select a local school or teacher and provide them a free copy of the book on your behalf (we will not share your name or information with the recipient). We can provide bulk discounts, depending on the number of books and/or decks ordered. Please contact us to discuss the options. Are the authors available for interviews or speaking engagements? The authors are available for online or phone interviews. For in person engagements, Cortney is located near Tampa, while Natalia is located near London. Please contact us to discuss availability and arrangements.